Just like the NH and US economies are producing more goods and services with less and less energy content (as measured in BTUs per dollar of gross domestic product), so too is the NH economy producing more goods and services with the same or less electricity content. As the chart below shows, over the previous decade the total electricity consumed in NH (in kwhs) increased by just over 7% while real gross state product increased over 36%. 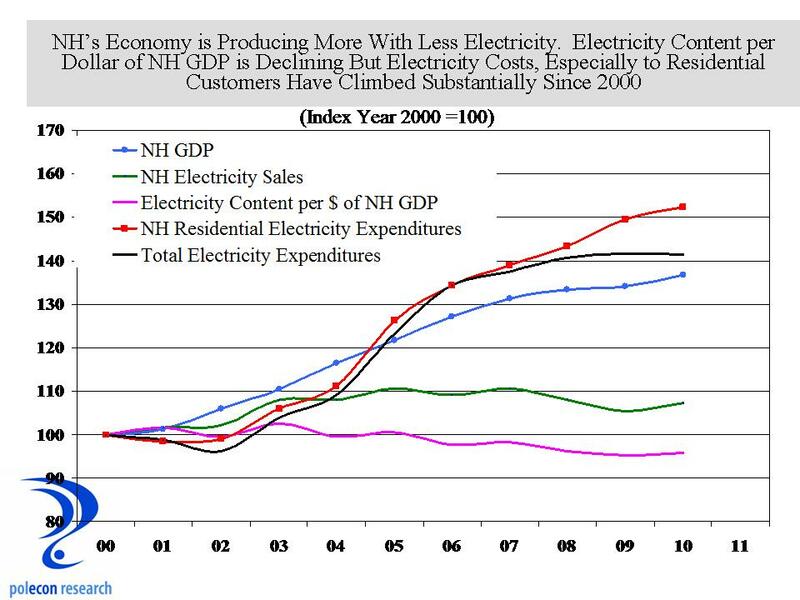 The result is that electricity content (in terms of khws) per dollar of real NH GDP declined during the decade. I don’t know whether the proposed Northern Pass Transmission Project (NPT) will actually result in lower prices for wholesale electricity or not. I’ve seen conflicting studies from proponents and opponents (by way of disclosure I conducted a study of the NPT employment impacts for competitors of the companies planning NPT but I did not examine impacts on electricity prices nor do I have any contracts or agreements with anyone opposing or competing with NPT). I do know that NH spent an estimated $1.616 billion on electricity in 2010 (the last year for which data is available from the U.S. Energy Information Agency). That means if proponents of NPT are correct, and wholesale electricity prices in NH are reduced by about $25 million, and that wholesale price results in a similar reduction in retail electricity prices (? 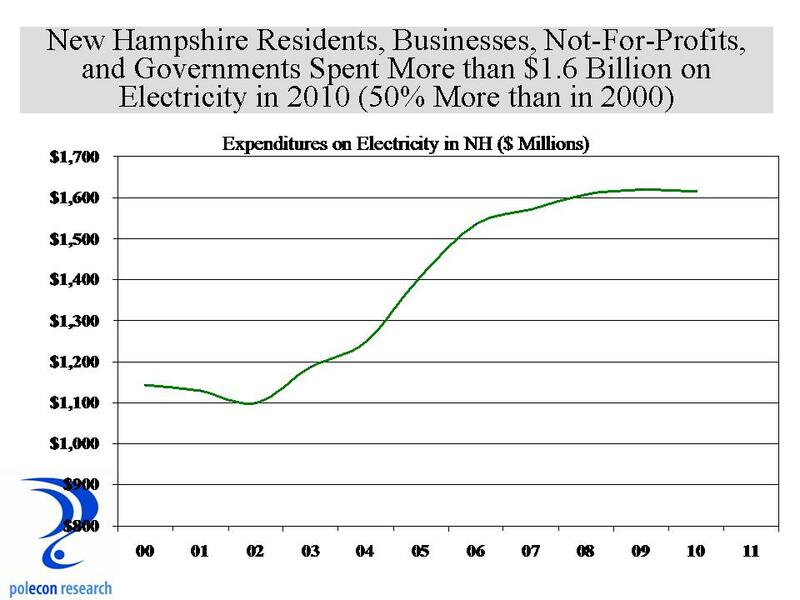 ), then electricity expenditures in NH would be about 1.5% lower then they otherwise would be. Whether illusory or not, given the consumption and expenditure trends lines above, it is hard to see that this impact on wholesale electricity prices will have much of an impact on the high cost of electricity in NH. This entry was posted on January 14, 2013 at 1:54 pm and is filed under conservation, consumers, Electricity, Energy, NH. You can subscribe via RSS 2.0 feed to this post's comments.